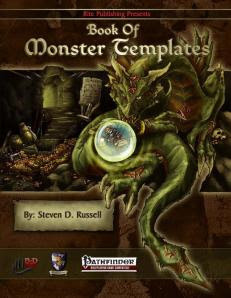 Book of Monster Templates by Rite Publishing. DISCLAIMER: This review is based on a PDF copy provided by Rite Publishing. Summary: 4 pawprints. Book of Monster Templates (BOMT) is useful for GMs looking for something different and for classic adaptations for their Pathfinder game. The artwork is solid, minor typos lurk at the edges but the content itself is consistently good with strands of brilliance. The use of templates makes things easier for a GM and promotes rapid play. A good template can form the core of a campaign arc. Combination of templates is good in moderation - too many games can become creature features. A whole book of templates may spawn multiple campaigns. There are blinding examples of brilliance here at all character levels. Undead sea hags doomed to eternally collect taxes, liches orbited by shrunken dragon's heads singing their praises, parasites stirring armies to fight wars for demons and devils, irresistable forces made flesh, bizarre experiments, hiveminds and magically-imbued entities. Some templates adopt classic archetypes while others adopt a more Questhaven-centric worldview but it's easy to hack them into your game. This book acknowledges it's influences without excessive lampshading - references to Aklo, beasts changed by eating magical items and giants gaining power from the earth show both literary roots as well as elements borrowed from comic books and movies. You'll also recognise familiar faces, GMs looking for particular setting hacks for Pathfinder can find them here. Artwork/Layout: 4 pawprints. Black & white interior art is consistently good and the cover by Hugo Solis shows a rune-carved dragon about to consider the dilemma of ordering dungeon takeout (i.e. adventurers). In closing you probably won't use all of them. That's not a bad thing, some are specialised tools but the strength of BOMT lies not just in it's ideas but also it's reusability. You'll be able to return to this well again and again if you're a Pathfinder GM. This one is worth your time. It's a nice book, some eminently adaptable to the City I think. Hadn't heard of this one yet. It sounds like a good addition. This templated setup is actually very good. It's an actual effective working GM tool that can be used over and over and retains its value without being just useless paper. The more they can tie into that, the stronger pathfinder is going to be in the long run.